As you know – the 27th Annual Kaslo Jazz Etc Festival is quickly approaching, and we are hard at work making sure that this August long weekend is a magical one for everyone in Kaslo! We realize that accommodations are tricky in our small slice of paradise, and South Beach campground is what has allowed the Jazz Festival to grow and become what it is. That said, “South Beach” only exists for 4 days out of the year, and for the rest of the year it has other purposes. As we’ve started ramping up this year, we’ve realized that this campground may not have the same rustic charm it has for the past 2 summers, and we felt it our responsibility to share some information with you, in preparation for your arrival. The South Beach Campground is currently sharing land with a construction company that builds for BC Ferries. They began building a new ferry in late May, and until now we haven’t had a clear picture what that would look like for South Beach. Realistically, South Beach Campground will be different than it has been in previous years. We have been working with everyone involved to make this as smooth an experience as possible, but the reality is there will be compromises. As a result of the ferry construction, there will be a fenced off area that is completely OFF LIMITS to all of us. We are reducing the South Beach capacity to allow campers to spread out more and ensure there will be no camp sites situated next to the fencing. The contractors have agreed that the worksite will not be active during the festival except for welding inside the boat from 10:30am-4pm daily. We will continue to work hard to ensure those times are adhered to, and that any disturbances due to construction are minimal. The campground will still be beautiful – right next next to the beach, a short walk from the Festival, and this year’s team is very dedicated to ensuring a positive experience for everyone! Please be sure to read the full list of South Beach updates below, and feel free to reach us through the Contact Us page if you have any questions. There will be NO RE-ENTRY of motor vehicles. Once you have entered South Beach, your vehicle must remain parked in the campgrounds until you are ready to leave. This measure is to help with dust control, and also to help keep all campers and pedestrians safe. To ensure this positive experience of everyone staying at South Beach, quiet time will be strictly enforced from 12:00AM-8:00AM each night. All South Beach campers will be given a wristband upon arrival (max. 4 wristbands per pass). Visitors without a wristband can not enter South Beach campground between 12:00AM-8:00AM, and people without South Beach wristbands will not be permitted to stay in the campground during quiet hours. There will be 24 hour on-site Security, First Aid and a South Beach Campground Host Team all weekend long. They are centrally located in the campground for your safety and security. Smooth Moves will be offering non-dairy, organic smoothies, smoothie breakfast bowls, coconut soft serve, coffee and more all weekend long! The Kaslo Jazz Etc. Festival is striving to improve your experience while staying at the South Beach Campground; please keep in mind it is a rustic campground with very limited services provided: port-a-potty toilets, hand washing stations, waste stations (for compost, recycling and garbage). There are no RV hookups, or services. 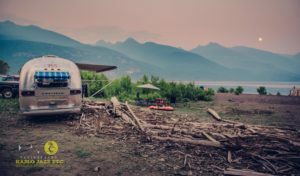 We hope you have a great time at the South Beach Campground and look forward to seeing everyone at the 27th Annual Kaslo Jazz Etc Festival! 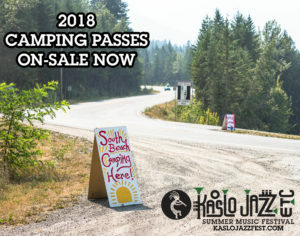 2018 Camping Passes On-Sale! TICKET UPDATE!